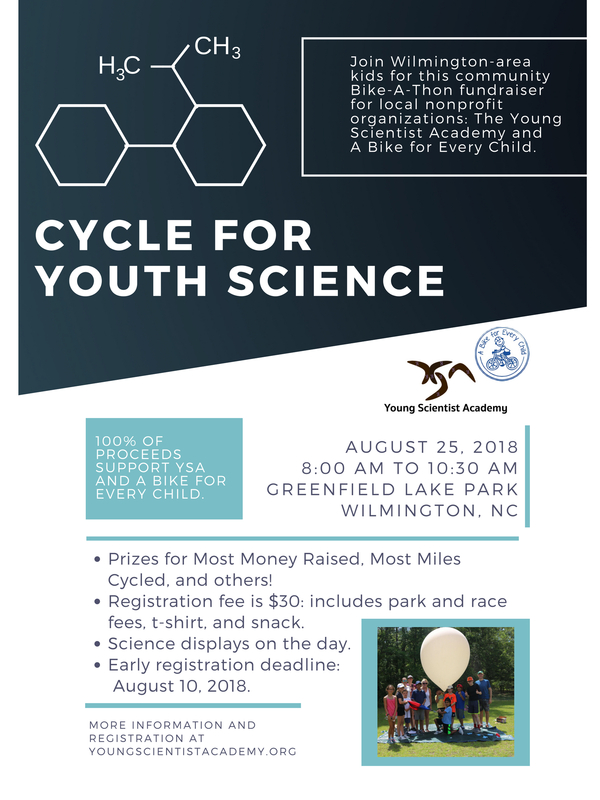 Join Wilmington-area kids for this community fundraiser for local nonprofit organizations: the Young Scientist Academy and A Bike for Every Child. Registered participants will obtain sponsors and raise funds based on miles cycled during the event. Post race prizes will be awarded for money raised, miles cycled, and other special awards. Corporate ride - Tour de Cape Fear - where Dr. Rob and Kelly will ride 120 miles throughout SE NC two days prior to raise awareness of our programs to rural communities impacted by Hurricane Matthew. 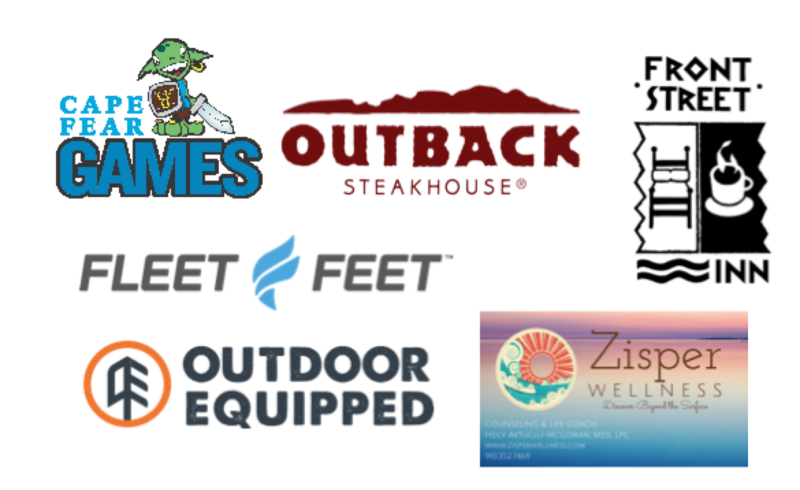 ​Goal: Our goal is to raise $30,000 for our programs. All funds raised by the “Cycle for Youth Science" program will kickstart our program in downtown Wilmington by providing children and youth interactive research facilities and artistic space at the Jo Ann Carter Harrelson Center. Event Time: 8.00 - 10.30 am. Race check-in: Starts at 7.30am. Early bird registration fee: $30. Post race healthy snacks food and drinks. Early bird registration closes Friday August 10, 2018 but entrants may register anytime up until race day for $40. Adults can participate as helpers only but must register at no charge if they wish to supervise children around the course. Open to any K-12 youth that would like participate by cycling and logging miles cycled in their own neighborhood anytime between Aug 10 - 25, 2018. Requires registration and a minimum of 5 sponsors to participate. Participants should first estimate how far they will ride during the Bike-A-Thon. 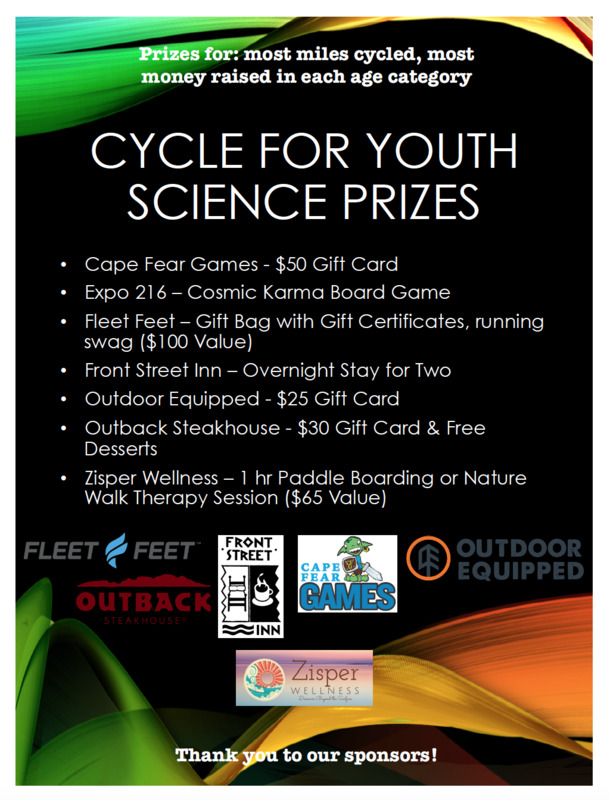 Based on this distance, each participant will seek sponsorship by filling out the 2018 Cycle for Youth Science Pledge Sheet. Sponsorship Pledge Forms can be downloaded here by clicking on the image. Greenfield Lake Park is a beautiful urban park located about 2.5 miles from downtown Wilmington. The multi-purpose trail consists of 4.1 miles of flat, paved surface around the perimeter of the lake and provides a safe and fun venue for children and youth to participate in the Cycle for Youth Science Bike-A-Thon. As you ride observe the unique nature that make this park special, such as the huge cypress trees, turtles, geese, and yes even the stray alligator! ​Images from Greenfield Lake Park. Cyclemeter is a super free app for logging miles and routes, cycle times, and even calories burned. Doesn't use much data. Available for iPhone and Android devices.